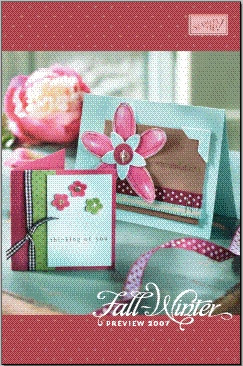 Craftin' Caro: The Fall-Winter Preview Brochure has been released! The Fall-Winter Preview Brochure has been released! It's only 8 pages, but Momma miht have once told you that good things come in small packages. Inside you'll find loads of wonderful new stamp sets, papers and accessories to inspire you, all of which will be released in the July catty. If you would like want to learn more about how YOU can play with these great sets and accessories, feel free to email me or check out my June Events Calendar for more info on my big blow out party at the end of the month! Where can we read the brochure?